Ocean, countdown. – Dirty wet dog , boats and sailing. Within the next 2 years i want to have a boat ready and be ready myself to go off and have the next sailing adventure. At that time, spring 2020 i will be 62 and should be a year into normal living after recovery from my knee surgery. I happen to think that the next few years, from 60 to 70 are the absolutely critical ones to get things done and we all know how quickly time passes by and stuff doesn’t get done. Now, i’m sure that is because Chris doesn’t want to be held responsible for the non-boaters , or their precious brats, bumping into themselves/falling over things and so on. The real reason i suspect is that just beyond the sign is the shed where much of the yard’s ‘language’ comes from when somebody is having a bad day with boat pox, gribble or just plain old boatbastardness ! I could be in there right now with Inanda. Early on in the potential project i did ask Chris-the-boss if there was any chance of shed space from the autumn onwards. The answer then was a tentative ‘maybe’ that gradually morphed into a ‘not likely’ and then a definite unequivocal ‘no’….fair enough then. I think i was looking at a minimum of 2 years in the shed and that only if things went very well. I have definitely saved myself from that future and the one i have to plan instead is finding, buying and fitting-out a viable offshore boat. Not just the budget but the project is a bit tight in both regards. In real time i only have the opportunity to see one boat at best without doing a manic road trip and that would be pretty horrible in the weather we are having. I don’t know why it is but most of the boats on my actual ‘to see’ list are all right across the country again and i just don’t fancy another 9 hour trip just to see one boat. 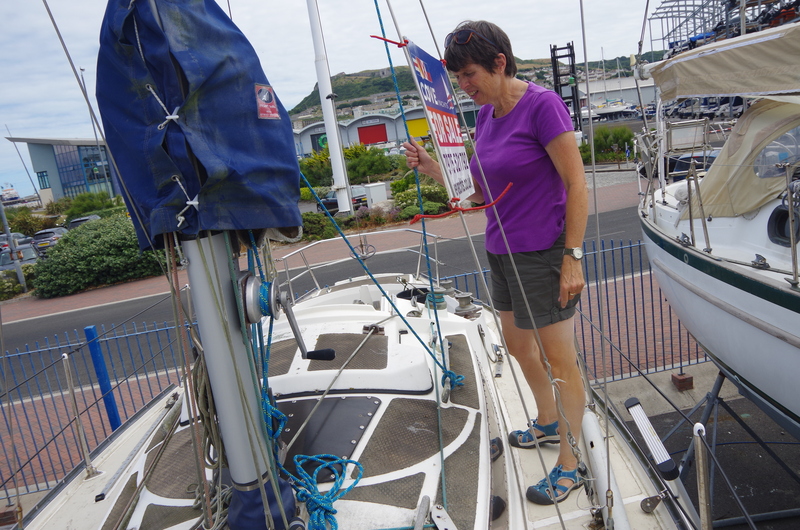 After one or maybe 2 boat visits that’s just about it for several weeks until i am driving again….as for up and down ladders and in and out of bilges i have no idea ! What this all means is that the summer is effectively now a no-go for boat nebbing and i would then really have to crack on with the job , maybe in September to have any chance of finding, buying (if at all) and getting a boat back to base to start the work. It might have to work, if weather and tides don’t, that a boat would have to stay away from home and the work gets done at a distance until say next spring. Having taken a look at Wareham for example a boat anywhere in that area might go there and go ashore at the same yard where we had Inanda ashore briefly. That would mean a regular commute of 3 hours each way when i had enough days off together until days get too short for effective work….it also means going back to having the entire workshop in the back of the truck again. Next year would then be all about putting the project boat into full offshore mode, for example fitting a windvane and cockpit protection just for a starter. The boat doesn’t have to perfect, i know we can’t achieve that with a limited budget but it does have to be capable of an offshore test voyage next summer. As i say…that’s tight. Next Ocean : simplicity, pleasure and peak experiences. Times a ticking by at least you have avoided 2 years in the shed which unless it’s your thing can be horrible. Its actually quite fortuitous that i didn’t get a space in the shed. As it happens the compromise might be completely different than either of us imagined.